February is here...which means Valentine's Day is just around the corner. For this month's Wendy's Favorite Things, my Great Eight is featuring romantic and delicious Valentine's gift ideas for the special food and wine lovers in your life. There's something priced for every budget...and every type of Valentine. I love all of these items, and I'm so excited to share them with you today! 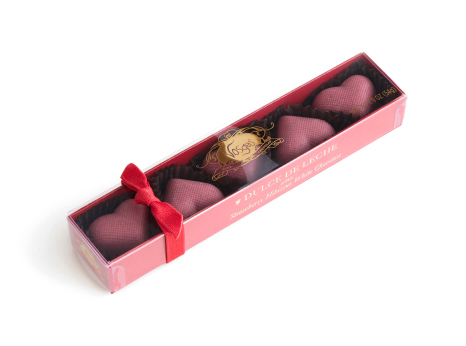 (1) Vosges Haute-Chocolat Valentine's Collection. An elegant heart-shaped box filled with beautiful chocolates is a classic Valentine’s Day gift. One of my favorite chocolate brands is Chicago's Vosges Haute-Chocolat. Vosges founder Katrina Markoff is known for her wildly creative flavor combinations that combine premium chocolate with a variety of delicious spices, flowers, roots, herbs, and liqueurs. This year’s Valentine’s collection features products in a range of prices for every budget. For just $10, you can buy your special someone their five-piece Dulce de Leche within Strawberry Hibiscus White Chocolate Hearts. Their delicate pink color is so feminine, and the flavors are perfectly balanced. If an upscale heart-shaped treat is your preference, Vosges has got you covered with a trio of creative offerings. The $15 petite purple heart contains 4 ounces of buttery Bapchi's Caramel Toffee topped with deep milk chocolate and chopped nuts. The Collection du Coeur heart boxes are filled with truffles, bonbons, and bites. The white heart box contains 17 pieces, including a delicious Rose Raspberry Truffle and a white chocolate Lemon Verbena Heart topped with red peppercorns. This beautiful Valentine’s gift is priced at $55. Priced slightly lower, at $35, is the nine-piece purple heart box. As a special Valentine treat, my friends at Vosges have provided The Weekend Gourmet readers an exclusive discount code to save 15% off online orders for the entire month of February -- and there's no minimum purchase required!! To redeem this special code, visit their online store and enter the code TWG15 at checkout. (2) Bissinger’s Chocolate Covered Valentine Cookies. Is your honey a cookie lover? Then, Bissinger’s chocolate has the perfect Valentine gift idea for you! Their Valentine's line features an elegant gift box filled with a dozen chocolate sandwich cookies that are dipped in creamy milk chocolate and embellished with seasonal Valentine décor. These yummy cookies are pretty to look at -- and they’re downright addictive. We had a hard time stopping at just one cookie! Creamy milk chocolate gives way to a crunchy chocolate cookie filled with cream filling. These cookies come ready to give in a pretty box, so you’re good to go! The 12-cookie box costs $32 and can be ordered directly from Bissinger’s via their online store. (3) Papyrus Truly Madly Deeply Stemless Wine Glass. 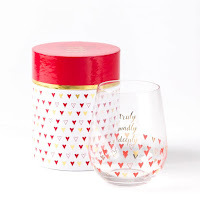 If your special Valentine is a wine lover, this pretty and sentimental stemless wine glass from Papyrus is a perfect gift idea! This stemless wine glass is decorated with pretty red and gold hearts, and it has the words “truly, madly, deeply” inscribed on it. It’s like a romantic Valentine card they can use all year round! It comes paired with a matching gift box, so it arrives ready to present to your sweetie. Priced at just $14.95, you can pair this adorable wine glass with a bottle of your sweetheart’s favorite wine for the perfect combo gift to celebrate this special day. This -- and other fun Valentine wineglasses can be purchased at the Papyrus website. (4) JARDESCA Apertif. Speaking of wine…why not give your sweetheart a little something different this year? JARDESCA aperitif is definitely refreshingly different! Aperitifs are intended to be enjoyed as a prelude to a meal, to stimulate the appetite without overwhelming the senses like some cocktails or heavier wines can do. Made in Sonoma, JARDESCA is a blend of three different white wines that's fortified with grape brandy (eau de vie) and 10 different botanicals. 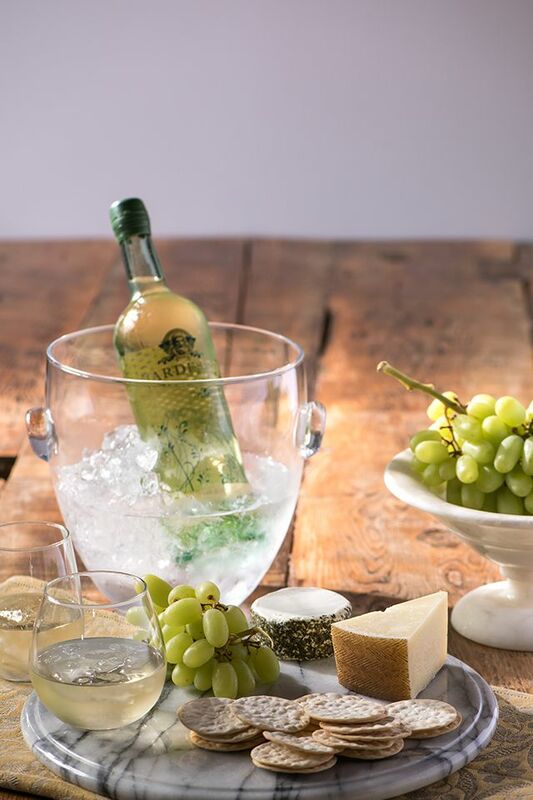 JARDESCA is meant to be served chilled over ice to best enjoy its light flavor profile -- and it can be used as a mixer for a range of wine spritzers! JARDESCA retails for $30 and can be ordered online for Valentine gift-giving. For my Texas readers, JARDESCA will be available at all Texas Whole Foods locations starting in March. (5) Sift Dessert Bar Conversation Heart Cupcakes. 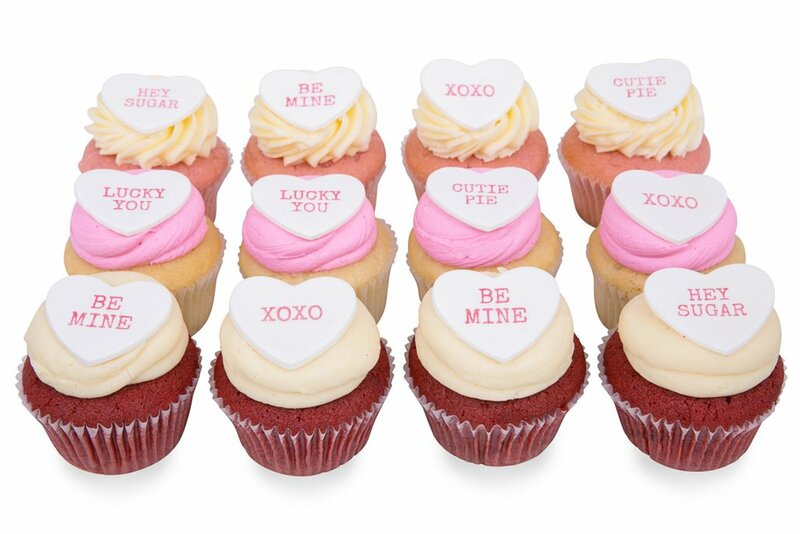 Is your significant other crazy for cupcakes? Then, these romantic conversation heart are a perfect Valentine gift! Sift Bakery is located in Northern California…and they’re a 2011 Cupcake Wars winner. Luckily, they ship their delicious cupcakes nationwide so everyone can enjoy them! This 12-cupcake collection includes three amazing cupcake flavors: Pink Champagne (raspberry cupcake with champagne buttercream), Ooh La La (red velvet cupcake with cream cheese icing), and the classic Vanill-ahh (vanilla cake with pink-tinted vanilla buttercream). 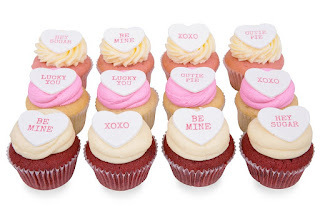 Each cupcake is topped with an adorable fondant conversation heart with fun Valentine sayings like CUTIE PIE and BE MINE! They’re shipped with cold packs in a crush-proof container to ensure they arrive in pristine condition. My cupcakes arrived in perfect ready-to-eat condition. Sift cupcakes are moist and delicious, with a generous amount of frosting. I especially enjoyed the Pink Champagne’s combination of raspberry and champagne…so elegant! This 12-cupcake collection is priced at $49.80 and can be ordered at Sift’s website. 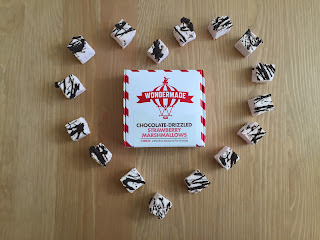 (6) Wondermade Handmade Marshmallow Valentine's Set. If you’ve ever tasted a homemade marshmallow, you know their texture is vastly different from typical mass-produced marshmallows. Florida-based Wondermade Marshmallows features a line of creatively flavored artisan marshmallows, including two fun Valentine gift sets. 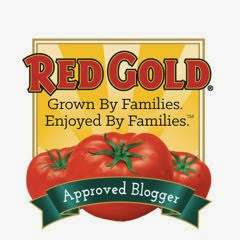 I tried their Rose Raspberry, Chocolate Drizzled Strawberry, and Gold Champagne flavors -- and I loved them! They’re light as a pillow and bursting with natural flavors. Each box contains 16 one-inch-square handmade marshmallows. The Rose Raspberry is made with rose water for a delicate rose flavor that pairs nicely with tart berries, and the Chocolate-Drizzled Strawberry is a fun new twist on a classic Valentine treat. The Gold Champagne marshmallow is dusted in elegant, edible 24K gold and has a subtle champagne background flavor. Two different Valentine sets are available at the Wondermade website for $34-43. (7) The Crispery's Giant Valentine's CRISPYCAKES™ Marshmallow Cereal Treats. Question: what’s better than a marshmallow crispy treat? 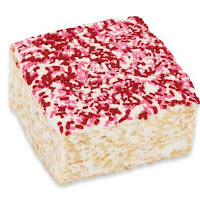 Answer: a GIANT marshmallow crispy treat that’s festively decorated for Valentine’s Day! The Crispery is featuring a set of four Valentine-decorated Crispycakes: red and pink sprinkles, hearts, Valentine’s Day, and Bear of Love! Each huge Crispycake measures 3.5 x 3.5 x 2 and comes individually wrapped to ensure maximum freshness. Not only are these marshmallow crispy treats super cute…they taste amazing too! They're handmade in small batches to ensure they turn out soft and chewy, with a perfect ratio of marshmallow to crispy cereal. They’re not at all sticky -- and they're the perfect size for sharing. The four-Crispycake set costs $39 and can be purchased at The Crispery’s convenient online store. (8) Zazzle Twin Hearts Porcelain Serving Platter. 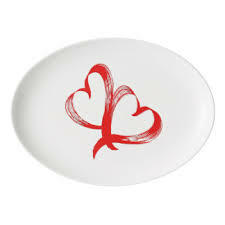 This white oval porcelain platter from Zazzle is just plain fun! It features two red interlocking hearts in the center that look like painted brush strokes, making it perfect for Valentine’s gift giving! Whether you gift this adorable platter on its own or pair it with some sweet goodies, it will definitely be a romantic gesture. Even better? 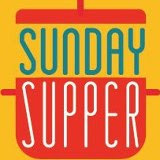 It can be used for at-home date nights all year long! 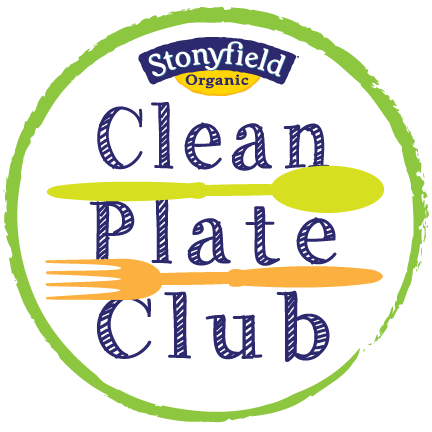 This medium-sized porcelain serving platter retails for $69.96 and is available at Zazzle's website. 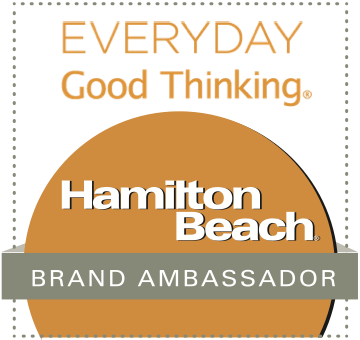 As an added bonus, Zazzle is currently offering a special code to save 15% on your purchase. At checkout, enter the code COZYUPSALE17 to claim your savings! Disclosure: The makers of the products featured in this Valentine's Gift Guide provided me with product samples to facilitate inclusion. My policy is to only recommend items that I have personally tried and liked. All opinions are solely my own.